I’ll start by saying this: you need to go and see a Kinetic Arts Theatre performance. I’m not exaggerating that throughout their performance of ‘Footloose’, I was either laughing or smiling for the full two hours straight. It felt like every single cast member was having a blast on the stage and they passed on the infectious sense of fun on to the audience too. The show was held at the Royal Welsh College of Music and drama. It’s a lovely location because wherever you sit has a perfect view and the performance feels quite intimate. The live band is also at the back of the stage, so you can see exactly what’s going on and what’s being played. Onto the show itself, perhaps my favourite element of the show was the humour. Most, if not all, of the actors had impeccable comedic timing, one liners & silly faces that had you giggling throughout. That humour was conveyed through several of the songs, too, and stand outs of this were ‘Mama says’ and ‘Lets hear it for the boys’. I didn’t spend one second waiting for the next scene. There were no ‘filler’ scenes in this production. Every scene & song was important to the story and a lot of the issues characters faced are relevant today. There were a few sombre moments that were handled well as all the actors had a natural stage presence. 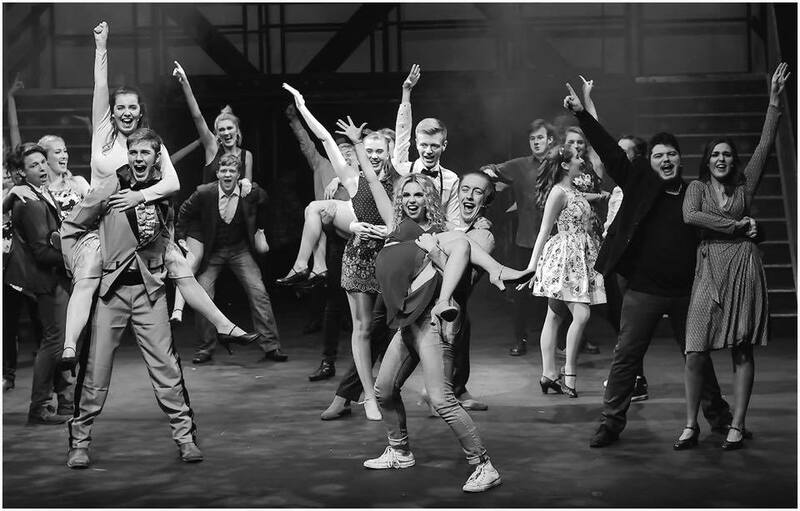 Kinetic Theatre Arts production of Footloose had everything you could ask for in a musical: catchy, upbeat songs, a relevant storyline, great acting & a whole lot of fun.